As we continue our series on wedding flowers and decorations, let's talk about color schemes. The colors that you select for your wedding will set the tone for your special day. You should consider and coordinate (but not necessarily match!) 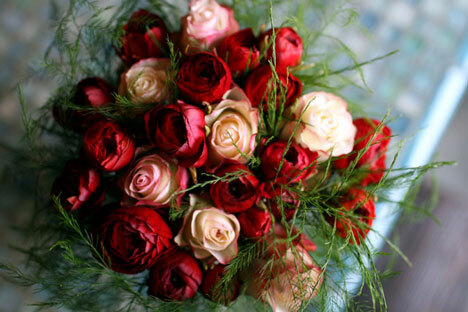 the colors in your flowers, decorations, bridesmaids' dresses, table linens, favors, invitations and cake. Tropical colors are perfect for beach weddings, while pastels work nicely for garden weddings. If you are having your reception at a banquet room or hall, consider the carpeting and decor of the venue. You don't want to clash. in spring, you might choose pinks and yellows. for summertime, vibrant purples, reds and blues work well. for fall, consider orange, rust and browns. for winter, burgundy, plum and forest green are top choices. A color wheel can help you find colors that go well together. A basic color wheel consists of the three primary colors (red, blue and yellow) and then a series of colors that blend between. Colors that are opposite of each other on the wheel are complementary. But you don't have to stick to complementary colors. Instead, you can choose analogous shades (those that are next to each other on the wheel). You can also go for a monochromatic look using two or three hues of the same color. If you adore one particular color you can use it as your central shade and just complement it with a neutral like off-white or cream. Red and Green - Not Christmas red and green (unless that's what you want). Instead go a little deeper and darker. Cranberry red and forest green look beautiful together. For flowers, roses are the obvious choice but don't forget about other varieties, including tulips, gerbera daisies and carnations. Black and White - For a sophisticated wedding, many couples select a black and white color scheme. It's a simple, classic look that is particularly nice for evening weddings. You can add metallic silver as an accent color. You have a variety of white flowers to choose from, including lilies, daisies, carnations, peonies, roses, sweet pea and many more. Pink, Pink, Pink - A monochromatic color scheme of varying shades of pink is a popular wedding color scheme. There are so many flowers in different pink hues from very pale to bold and bright. If you are looking for a subtle accent color to break up all the pink, chocolate brown is nice. Aqua and Peach - For a fresh look, aqua blue and peach work well together. This is a fabulous color scheme for a summertime wedding. Your bridesmaids can wear aqua dresses with peach sashes. 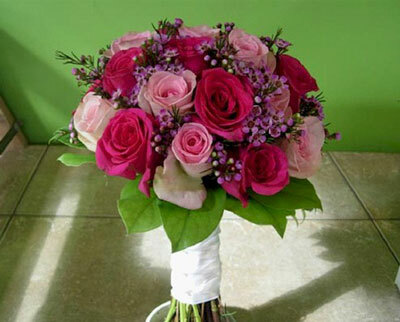 Bouquets can be a mixture of flowers in varying shades of the two colors. This color scheme is a fantastic choice for an outdoor wedding, whether at the beach or in a garden courtyard. 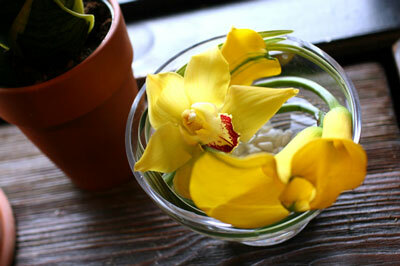 Yellow is a hot color for 2009 and can make a bold statement at your wedding. If you are using bright yellow, don't over do it. Tone it down with more subtle shades of mustard or pale yellow. The most important thing about your color scheme is that you like it. If you have a favorite, use it as the main color and complement it with metallics or neutrals. Even if you establish an unusual color scheme, your flowers can be dyed to match, but remember that will add to your costs. 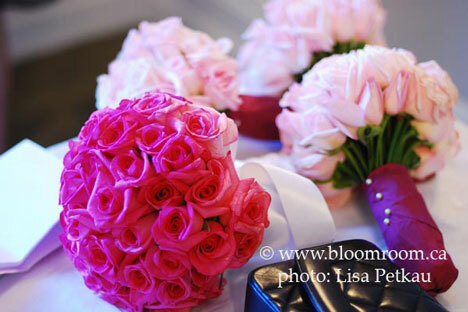 Find a wedding florist near you, in the Directory..